No, I’m not talking bridal or baby showers. Now, when hubby and I were first married (first few years, actually), we DID like to shower together. I mean, actually shower for the normal purpose of showering. (with of course some kissing and caressing thrown in. Don’t worry, not going into any more detail. LOL) Then, we just decided, mutually, not so much anymore. We had a ‘normal sized’ shower. I think it just began to feel a little stifling. ANYHOW, I can understand and appreciate the splurge of having a shower big enough for two. But we all chuckle at a shower big enough to throw a party in it. Don’t we and everyone on HGTV that comes across one? Anyhow, do you think there are that many people throwing shower orgies, or is it just an “I can afford it, it looks luxurious, so I’m going to splurge on my shower” thing? This entry was posted in Uncategorized and tagged showers on July 10, 2018 by Silver Willow. Years ago on a trip to Toronto and friend and I stayed at a B & B that had a huge shower room similar to this. Although I showered in it alone, I did love the expanse of it with all it's different shower heads at different levels. It was quite a luxury. most people think that bigger is always better! why is that? more to clean! LOLI have always wanted a shower that didn't require a shower curtain or door.I saw one in Greece (in a photo once) and I fell in love with it. that's what I would want! Now that is a big shower! We have had walk in showers with no ledge to step over or shower door to clean in our last 3 homes and love it, but our showers were not that big! my husband and I showered together for many years until one day I was ready and he was not and I showered anyway. been taking separate showers since. that is gorgeous to look at but really? I gave an estimate for some work to a woman once whose bathroom was bigger than the master bedroom. 'that was the dream' she told me. uh, okaaaay. Well that's a gorgeous shower, nuff said! To me that's space I could use for something else in the bathroom! Pretty but too big! Seems a waste of space to me. Yeah, about 2/3 that size would be more than sufficient for us! yep. But I guess when money is no object…. I wouldn't really like a shower that big. Too much too clean and too much wasted water and marble floors are really slippery. But with a little tweaking on the one above it would be good for a person in a wheelchair. If this is only the shower room, I wonder what the rest of the house is like! Haha. 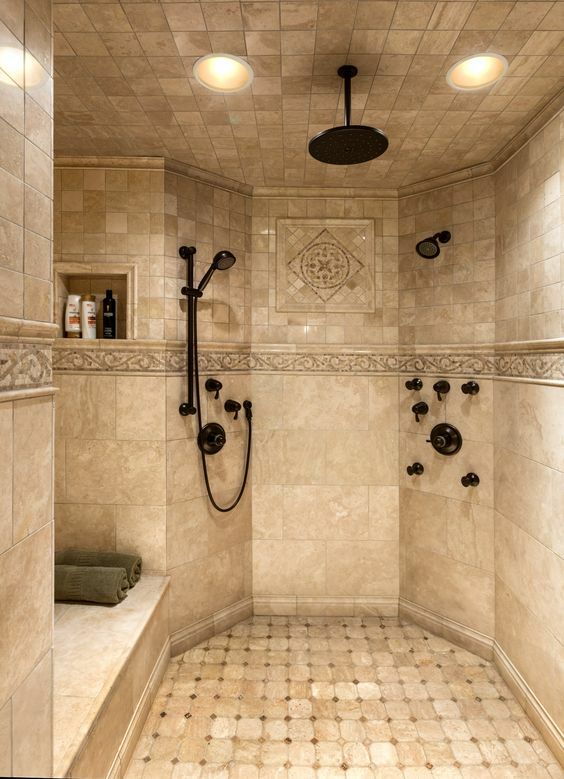 If you had a shower like that in the house, you definitely don't have to clean it yourself. I am stuck on the concept of inviting the neighbors over for a shower. I have a shower–a onesie– that only company uses. I'm a tub person myself but wouldn't turn down an over sized one.